Do you think of your smartphone as an electronic leash or as electronic liberation? As someone who’s trundled both cell phone and laptop to baseball stadiums during spring training, I’m in the latter group. We’re the kind of people who think our mobile devices give us carte blanche to time-shift, stay productive, and be responsive to clients, customers, and colleagues no matter where our adventures take us. Not everybody thinks that way, of course. Consider the folks at the Sabbath Manifesto, who are once again this year applying the principles of the Sabbath. Emulating the Lord resting on the seventh day, all work is supposed to cease (“cease” being the translation of the Hebrew root of Sabbath, Shabbat). The 2012 National Day of Unplugging starts at sundown today and ends at sundown on Saturday. Their goal is to get the rest of us to -- paraphrasing Timothy Leary here -- turn off, tune out, and drop off. That is, stop using our cell phones, smartphones, laptops, tablets, PCs, iPods, et cetera, and come back from the virtual world into the physical world where our spouses, children, partners, and pets actually live. For 24 hours, at least, we’re supposed to ignore our compulsions to check e-mail, update Facebook, and generally make our colleagues know we’re still available if they need us. We asked PCWorld's Facebook Friends what they thought of the concept. C Dodge Hemi Kelly commented: "Yes I will and yes I can," while Eric Schuetz took an opposing view, saying: "I admittedly will NOT be participating in this function. I see it as a pointless event simply that if one wishes to "unplug", they would do it any day of the year." A sleeping bag for phones. 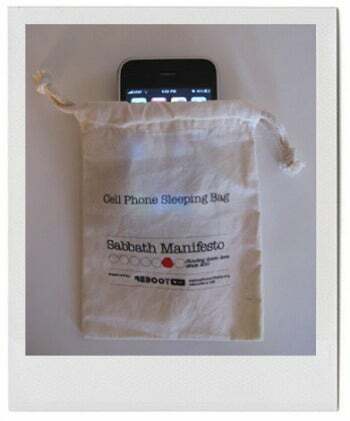 Consider that Sabbath Manifesto reps were able to convince several hundred people at this month’s South by Southwest conference, which is perhaps one of the most hip, connected gatherings, to unplug for an entire day. On the other hand, as some tech addicts have noted, it is highly ironic that Sabbath Manifesto is using social media as a way to spread the word for people to stop using social media. Frankly, if I have to give up technology, I’m going to need a lot to drink. But on the other hand, the idea of spending more time with my peeps instead of beeps is nice too.